By Julie Matheson, August 2011. The Traditional Owners are the Karriyarra people. They call the harbour Marapikurrinya for the hand shaped formation of the tidal creeks coming off the natural harbour. 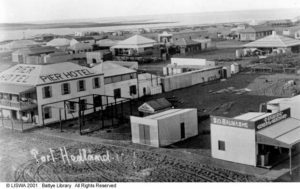 In 1896 the State Government named the harbour Port Hedland after Captain Peter Hedland. This page is a draft to be reviewed by my peers from Port Hedland. I decided to create it after I found it difficult to locate information about Port Hedland on the internet. Please let me know of any omissions and errors. One of the first institutions “founded at the time of the birth of the town” was the Port Hedland Race Club in 1896, ref. Clutterbuck & Doohan, 2003, p.32. The first white child born in Port Hedland and recorded by the Thompson family was a boy named Roderick Hedland Thompson on 8 September 1898. He was one of thirteen children of Annie and Bill Thompson Ref. E G Clutterbuck & B Doohan, 2003, “Hedland, for auld lang syne” p. 6. Also in 1898 the four and a half mile long causeway connecting the mainland to the island of Port Hedland was completed, along with a jetty making it possible for the influx of food, machinery and settlers to arrive in the Pilbara district. The construction the jetty made it possible for building to commence in the town. There was no suitable timber or other building material available in the district, all needing to be shipped in from elsewhere. In 1899 the Moore family arrived in Port Hedland from Condon after purchasing acreage on the island of Port Hedland at “one mile”. The first primary school opened for junior citizens in 1906 (Ref. p. 23). The following year in 1907, Port Hedland experienced its first strike, that of parents not allowing their children to attend school until “a list of demanded structural alternations had been carried out by the Education Department in Perth”. The Port Hedland Race track has been hosting horse races since 1908. Race Week was the major gala event of the Pilbara and surrounding districts with the largest festive social gathering of the year. The female population looked forward to the yearly celebrations, especially those living out in remote sheep and cattle runs. It was an opportunity to dress up in the latest fashions for mutual admiration by friends and acquaintances. The time of year for the races were based on the Neep tide when no ships could enter the port for loading or unloading of cargo. On 12 March 1912, the SS Koombana sailed out of Port Hedland, never to be seen again. In 1918 a bathing area was constructed near the long sand-spit made of poles driven into the ground and wire fencing to keep things that might bite out. In 1921, the first air field was developed at the Port Hedland Race Track and the town had an air service link with Perth using planes owned by the Western Australian Airways. It took two days to fly from Perth to Port Hedland. The flight would leave Perth first thing in the morning, fly direct to Geraldton and then the Carnarvon for an overnight stop. The next day the flight would leave Carnarvon then stop at Onslow then stop at Roebourne and then finally arrive in Port Hedland. The first pilots to land at Port Hedland were Charles Kingsford-Smith, Bob Fawcett, Norman Brearley, Val Abbot, and Len Taplin. This decade should be known as the first decade for cooling in Port Hedland. In 1931, the first motorised cooling system was installed at the Moore family’s butcher shop. Families who could afford it could also purchase domestic kerosene refrigerators. Second recorded category 1 cyclone in March 1942. Port Hedland was bombed around circa 1942 by Japanese air raiders with one loss of life. Perhaps they were searching for Corunna Downs secret air force base. 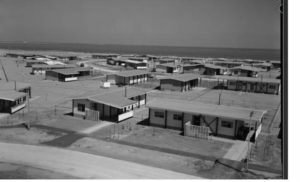 In 1942, Nissen Huts were built in Kingsmill Street on land that was once reserved for local Aboringinal people to house Port Hedland’s military defence. Following the war and the cooling of the 1930s, the first general cool storage facility was built in 1946 by the Public Works Department, procured from the Air Force Base outside of Port Hedland. In 1950, Manganese mined at Woddy Woody, becomes Port Hedland’s principal export. In 1952, Northern Minerals and Bell Brothers begin manganese mining at Woody Woody. Don Rhodes engaged to truck it to Port Hedland for shipment. The 4633 ton Pembrode becomes the biggest ship to enter the harbour when she berthed to load the first manganese shipment. In 1953, the Turner River Water Scheme began and plans were being hatched to expand the number of residents in the town. 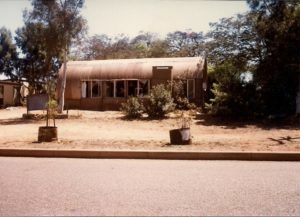 In 1956 the spinifex hut that welcomed arrivals to Port Hedland’s airport was replaced with a fibro-cement terminal building. Little did the people of Port Hedland know that an experimental town planning scheme was being hatched in 1954 with the idea of a house with a front and back access, that enabled the separation of pedestrians and vehicular traffic. The plan was to do away with the traditional grid-iron street pattern and replacing it with an innovation called the superblock (Ref. Radburn.org history). Forgive me if I indulge a little with the history of Port Hedland from my family’s perspective. My father, Colin Matheson, standing on the right of this photo was took a keen interest in every part of the development of the town during the 1960s, 1970s and 1980s. Port Hedland changed from the sleepy little town that my father came to live in during 1962 with just a few hundred people to thousands of construction workers camped on Spinifex Hill in 1965 where the Port Hedland Civic Centre now stands. The hugh influx of workers had exactly the same impact on the town as the mining boom of the 2000s. 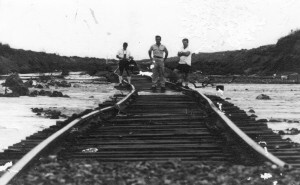 By 1966, the railway from Goldsworthy to Finucane Island was completed to take its first shipment of iron ore on the Harvey S Mudd. With the mining of iron ore, came the mining of salt. In July 1966, Leslie Salt sent construction equipment onto the current site, and within two and half years the first salt export commenced. In 1967 the historic post office located in Wedge Street was demolished to make way for the existing post office. This same year saw the start of BHP’s ambitions to export iron ore from Port Hedland. A significant event for the town was the air crash of a MacRobertson Miller Airlines on 31 December 1968. My father was called to the crash site to take photos as a reporter for The West and the Hedland times. Twenty two passengers and five crew were killed in an incident caused by the right wing braking away from the fuselage. The plane crash site was found at Indee Station near Port Hedland. The development of Cooke Point commenced in 1968 with the first house built at ???? Cooke Point 1968, Leeds and Harper Street. By 1969 the ore crusher was built and the first iron ore shipment for BHP was loaded and sent to Nelson Point. The Osumi Maru was loaded with 100,000 tonnes of iron ore on 1 April and was headed to Japan. The locals weren’t too concerned with the dust because the cash registers were ringing. By the 1970s the dust over Port Hedland was unbearable for most locals. I remember my mother cleaning our un-airconditioned house at 31 Moore Street every day, and the washing hung on the clothes line only to be covered in dust. Nothing escaped the dust. On 13 August 1970, aerial photos were taken of the first development of South Hedland showing two rows of houses being constructed. The Black Rock Stakes, like most good ideas, was born over a few beers at a bar in 1971. It developed and raised more than $1 million for charity and caused grown men, women and children to lump a wheelbarrow full of iron ore from a remote town called Goldsworthy and into Port Hedland. A new airport terminal was built in 1971 to cope with the influx of workers and company executives with interests in the town’s exports. Council elections were held in 1971 with Colin Matheson elected in a landslide along with Arnold Carter, both residents of Moore Street, Port Hedland. 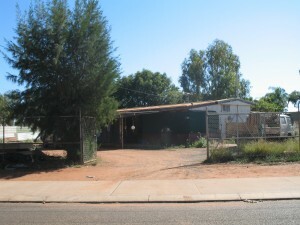 The first house built at South Hedland was at 46 Pedlar Street in 1970 and given a title in 1971. Port Hedland has its first upperschool with Hedland Senior High School located at Acton Street in 1971 and the new building built at South Hedland in 1972. Category 1 Cyclone Joan paid us a visit on 6 December 1975 and Cyclone Leo in 1977. In 1976 BHP continued to expand its production with a second processing plant at Nelson Point which increased annual production to 40 million tonnes, including the dust. The start of 1978 saw a decline in world markets for iron ore. The world’s steelmills were losing money through an economic slump. The future of Goldsworthy looked tenuous. 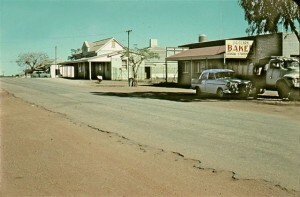 In 1982 Port Hedland experienced an earth quake, one of the areas largest ever recorded. The town also claimed international status with the first international flights to Bali in 1982. From 1985 the town suffers a significant set back with BHP mothballing significant rail carriages as the demand for iron ore is substantially reduced. The town’s population diminishes from 14,000 down to 8,000. My father experiences his own financial crisis with a visit from the bailiff to repossess his car and the contents of his home. All this while he is funding the remaining 3 children at Hedland Senior High School. Now finally my father’s wish eventuates with opening of the Pretty Pool housing estate in 1987. The first home built there was ??? (probably on Matheson Drive). Catergory 1 Cyclone Connie visits Port Hedland in January 1987. After 17 years on the council, Colin Matheson lost his seat in the Council elections of 1988. On 12 September 2006, head lawman for the DeGrey area, Peter Coppin, passed away. He was renown for the extent of his ritual and ceremonies knowledge. In his final years he was cared for in the Yulanya Aged Care Facility in Port Hedland where Sue Dann worked at the time. It is now 2016 and Port Hedland’s median house prices have crashed 50% from over $1,000,000 in 2011 to a median price of $500,000 with an average rent of $700 per week. A 120 year mile stone will be celebrated on 23 October 2016 since the town was named Port Hedland after Captain Peter Hedland who discovered the natural port in 1896.